Welcome to the all new East'ard Marine Supply! Join our mailing list to receive the latest news and specials from Eastard Marine! Your subscription was successful. Welcome aboard! During our recent visit to Jarrett Bay Boatworks, I visited the East’ard ship store. As a 35 plus year professional Captain and marine industry veteran , It was quite refreshing to see such a well-stocked facility. I travel to marine repair facilities in the US and abroad. You don’t see many facilities that actually stock the materials, products and hardware that maritime professionals are looking for and are on the shelf in your facility. Please commend your staff responsible for getting the store up and running and actually stocking what a professional mariner would expect in a first rate ship store. I wanted to take a moment to thank you for putting in East’ard out there at Jarrett Bay. In the process of putting Annie O together the past couple of years for Brad Sutton I have needed some simple and some pretty obscure parts. Each time I have had a hard time finding an item, somehow your guys out there always seem to have just what I need in stock. Rich is easy to work with and more than helpful. It seems every time I go to the store they have more and more items that you can’t find elsewhere locally. I just wanted to say thank you to all of y’all for making my job easier. Have a great day sir. 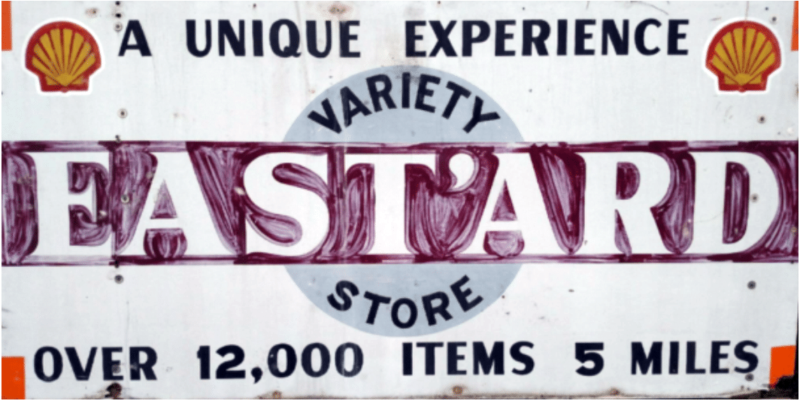 Formerly known as East’ard Variety Store, East’ard Marine Supply has reemerged to become the premier marine supply store in Eastern North Carolina, while maintaining the friendly atmosphere of it’s Harker’s Island country store roots. “The Variety Store”, also known as “Cab’s” was previously owned and operated by Cabell Ramsey, and later sold in 1996 under a new name. Now, Cab’s son and owner of Jarrett Bay Boatworks, Randy Ramsey, is re-launching the store to provide the “unique experience” that his father made famous so many years ago. East’ard Marine Supply is nestled into the expansive Jarrett Bay Marine Park located in Beaufort, North Carolina and offers over 15,000 parts in-stock with thousands more available by special order, plus an equipment rental service to be sure you can get the job done from start to finish. East’ard Marine Supply is here to fulfill all your parts and supplies needs for anything marine from basic repairs to complete refits and rebuilds. Come by to see what sets up apart from the rest in service and inventory!